The KM2 has been specifically designed to resist cuts and chips that can be caused by sharp rocks and obstacles when driving off the beaten track. The aggressive sidewall lugs featured on the tyre, deliver strong bite, particularly when the tyre is used at low pressures. These enable the tyre to grip all surfaces, be they smooth or rough. The thick rubber used to build the sidewalls, helps to protect the tyre against dangers encountered off-road. Weakness in a tyre's sidewall, especially on a 4x4 tyre, can very quickly put a dampener on off-road activities. 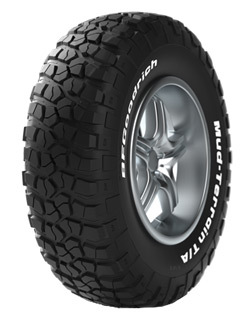 The oversized sidewall cords featured on the KM2 give the casing the protection it needs for punishing off-road use.